The future of the mainframe is open to all. Open source isn’t a trend anymore. It has become the de facto standard for millions of IT organizations, and defines large portions of the industry. We benefit from open source technology every day in our personal and professional lives; new developers have never known a world that wasn’t open. The Rocket team is committed to bringing the benefits of open source to underserved platforms, including the mainframe. In fact, since 2010 we’ve ported more than thirty open source tools and languages to z/OS, including Git, Python and more. We’ve also taken a leading role in the new Zowe framework, helping set the stage for the next 50 years of mainframe innovation. We believe that opening up the mainframe to a new community of developers will supercharge the next wave of innovation, helping organizations solve real problems on the world’s most powerful platform. And, we can’t wait to see what they create. In 2018, we took our passion for open source one step further. Working in partnership with IBM, the Open Mainframe Project and CA Technologies, we announced, the first open source framework for z/OS. Zowe encompasses a modern technology stack that software developers require to be agile and responsive as their businesses become more tech-enabled. It’s completely open, and it was purpose-built for z/OS. Students graduating with computer science degrees aren't learning COBOL; they're learning to code in Python, Perl, PHP and TCL. 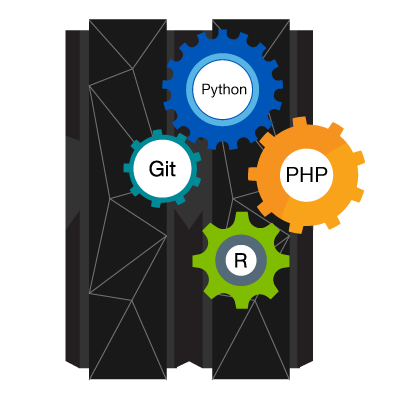 To help address the growing mainframe skills gap, we offer more than 30 open source languages and tools—including Git and Python—that allow any developer familiar with these popular tools and languages to harness the power of the mainframe without any previous experience. Rocket Open Source Languages and Tools for z/OS let your developers start coding quickly, without having to spend months learning new skills.